Pinned between hills and coastline, there are few sites in the UK that are just 200m away from a busy road yet boast such an undeniably enviable location. Characterised by the rocky Jurassic Coast, heather-coated hills and long, wooded valleys, the surrounding Quantocks are a magnificent place to explore. It was such local beauty that inspired a young William Wordsworth and his friend Samuel Taylor Coleridge, to pen many of the poems in Lyrical Ballads – a book often held to mark the creation of English literary Romanticism. More than two centuries on, the surroundings are just as inspirational. 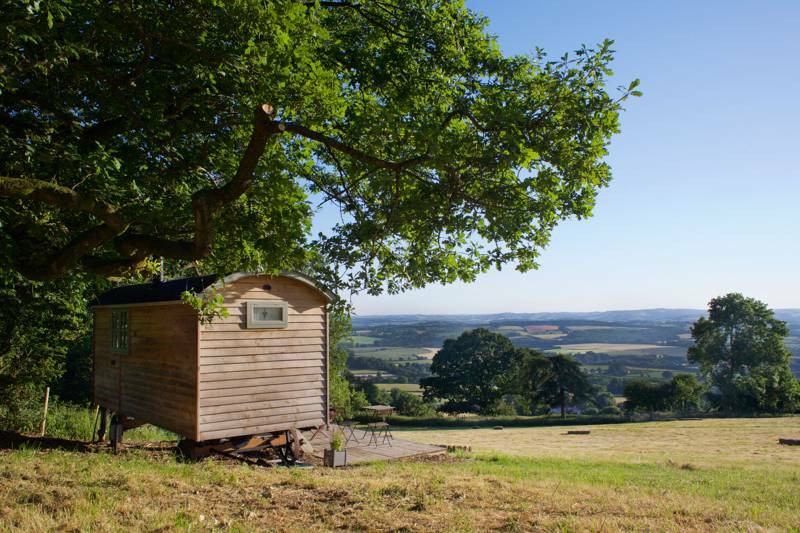 Located on a working arable farm, Moorhouse Campsite is a quiet, family-run site that boasts far-reaching views across this very landscape to the climbing hills beyond. There’s a range of options when it comes to pitches, with seasonal, hardstanding and tent pitches all on offer, each carefully spaced out and divided by maturing trees and hedges. The rich foliage provides not only privacy but also some extra summer shade for lucky campers, and shelter from the rain for unlucky ones. If you’re really worried about the weather, though, there are also two glamping pods for a little added luxury, kitted out with simple beds and mattresses. Onsite facilities are numerous. Two conveniently placed toilet blocks mean that late-night expeditions will never be too tasking and a single, centrally located shower block boasts wonderfully powerful showers. 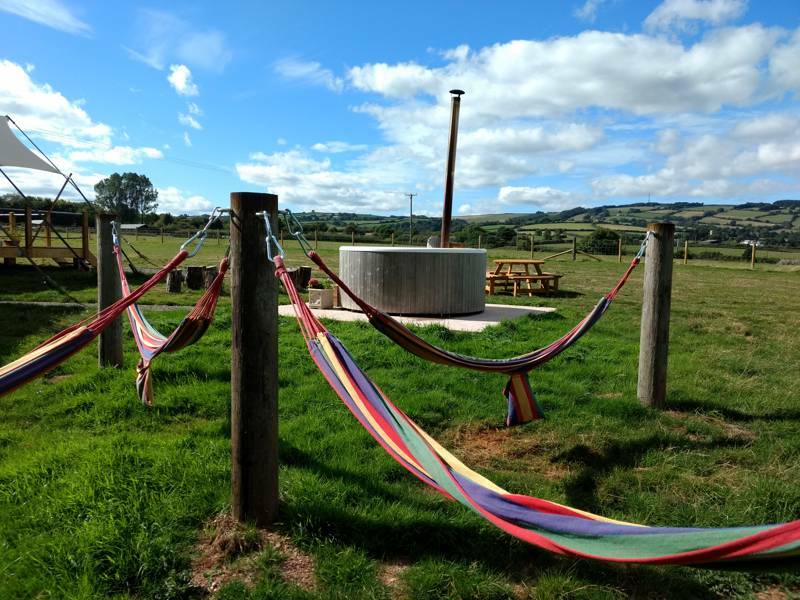 Laundry facilities are also available, and a landscaped communal barbecue area can be found in the tent field; campfires are also permitted in the designated firepits (logs for sale onsite). Perhaps most importantly, though, is the Mad Apple Cider which they produce on the farm and is available to those staying at the site. Unsurprisingly the Quantock Hills are riddled with mountain bike trails and footpaths, one of which, the ‘Coleridge Way’, allows you to follow in the footsteps of STC, best appreciated having swatted up on a few of his poems beforehand! If you want to learn more you can also visit Coleridge Cottage, situated around 3 miles from site. For many, though, the beaches are the main attraction. It’s a scenic 40-minute walk to Kilve Beach, with a footpath leading directly from the campsite's edge (or a 5-minute drive). It’s a great place to search for fossils as you dip in and out of the various rock pools. Further east the shingly beaches of Doniford and Warren Bay are similarly dotted with pockets of shiny water and are perfect for dog-walking and rockpooling – make sure you bring a net along! 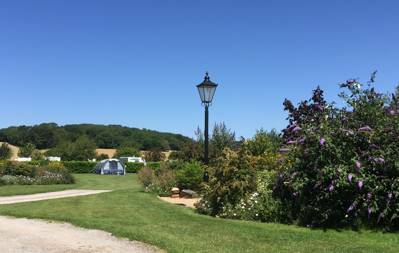 Nestled between the ‘Quantock Hills,’ an Area of Outstanding Natural Beauty and the Jurassic Coast, Moorhouse Campsite is a quiet, rural, dog-friendly family-run site. The area is surrounded by open farm land and far reaching views to the hills, with dog walks easily accessible directly from the farm. 2 separate fields for tents, plus 3 hardstanding pitches, 30 seasonal pitches and 16 caravan pitches. For a little more luxury there are also 2 glamping pods available. Both hardstanding and seasonal pitches, along with standard grass pitches. Electrical hook-ups available, washing up facilities, laundry facilities and toilet blocks with showers costing 50p for five minutes of hot water. Campfires are permitted at designated locations and there's a communal BBQ area. Games field adjacent to site. Try Fyne Court (01643 862452), an estate once owned by the Crosse family that was destroyed by a fire in 1894. Today visitors can take a tour of the beautiful gardens and learn about Fyne Courts most infamous resident Andrew Crosse, known to the locals as the ‘the thunder and lightning man’. Moorhouse would make the perfect setting for a Famous Five story. The surrounding Quantocks offer hearty hill walking, there are streams for afternoon tea picnics and a good rock-pooling beach nearby for scooping up hidden treasure. Mischievous adventures await. The Quantock Hills are home to what are arguably some of the most exciting mountain bike trails in the country and some beautiful hiking trails. The West Somerset Steam Train (01643 704996) can be boarded at Williton, a 10 minute walk away, and will take you to Minehead stopping at restored stations along the way. Kilve Beach is a great place to visit in search of fossils and also has a number of rock pools. Fyne Court is also close to the site where you can take tours of the beautiful gardens. Slightly further afield, a 30 minute drive, is Dunster Castle and Gardens, an ideal spot to visit for family day trips. The farm in which Moorhouse Campsite is located is a working arable farm which produces, among other things, ‘Mad Apple Cider’, which is available to buy onsite. The Plough (01278 741652) is a dog-friendly pub located a short 15 minute walk away that is perfect for evening meals. The Hood Arms (01278 741210) in Kilve is another dog and family friendly pub with a beer garden and a play area for the children, with a great selection of local ales. The Chantry Tea Rooms (01278 741457) is a wonderful daytime option for cream teas and is located along the scenic walk to Kilve Beach. Tents, caravans/motorhomes £18–£22.50 per night for 2 people (electric included). Additional person (3 years+) £2.50 for an extra person. Pods (sleeping up to 4 each) cost from £55–£60 per night. Small 1 man tent for mountain bikers/cyclists £13 per night. Travelling from Bridgwater on the A39, once you leave the 30 mile area into 50 mile area there is a brown tourist sign on your left for Moorhouse campsite which is 300 yards ahead on the right. At the sharp left hand bend, turn right onto the road signed Lilstock and Stogursey, Moorhouse is the first entrance on your right.